Happy Late Birthday, Katie! 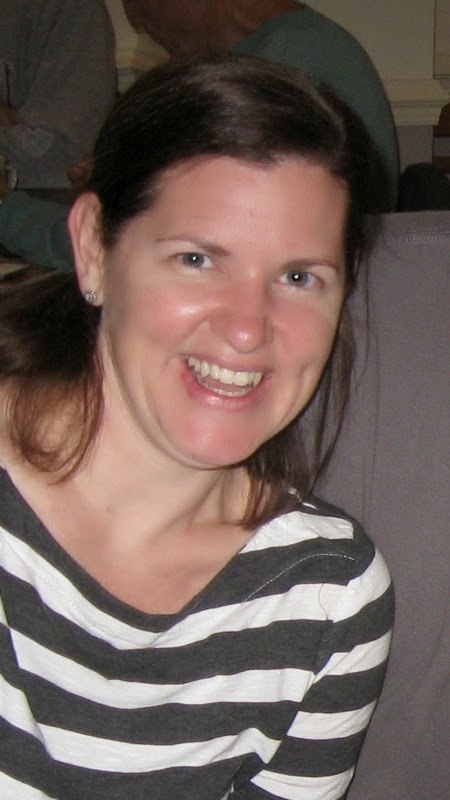 I am so thankful for Katie, a loving, creative, gracious daughter-in-law and a blessing to our family. As usual, I am a day behind. I can be early or I can be late, but being right on time evidently requires more discipline than I have been able to acquire. But her father-in-law and I caught up with her today and inflicted our long distance rendition of the Happy Birthday song with appropriate alterations for our tardiness. And she gave me the delightful gift of a detailed report about our two Louisiana grandchildren. That’s Katie, always giving. A guilty pleasure. I confess. I am extremely susceptible to the temptation that a Chick-fil-A original chicken sandwich offers. Yesterday we were on the road shopping and taking care of some banking an hour from home. It was way past lunch time when Husband Walter casually dangled temptation. Notice that I am already trying to shift responsibility. “Want to go to Chick-fil-A?” he tossed out. “Sure!” I responded without a blink and with no pause to consider sodium content and other circumstances of my dietary life. I had not checked sodium content on that particular fast-food chain’s chicken sandwich. But I knew very well that all fast food sandwiches are off the charts for sodium. I blissfully made my lemming-like way into the establishment anyway. I admonished the strident voice of my internal sodium bookkeeper to shut up and buzz off. Second thoughts invariably followed my consumption. My attempts to rationalize succumbing to temptation were feeble. On the unlikely chance that the tasty (i.e. salty), breaded (more salt) filet on a bun (even more salt) was a low-sodium creation in disguise, I looked up the nutritional info online. Sodium 1,390 mg, 110 mg short of my DAILY recommended intake! And the calories, fat and sugar? Well, I am not even going there. And I totally enjoyed every bite. Really rockin’. Hubby and I made a foray to the Dedeaux Clan’s showroom yesterday. The Mississippi Gulf Coast family produces solid wood, made-to-last furniture, much of it with a rustic charm. Rocking chairs of various styles are among their specialties. After we browsed and took a few measurements, we departed to our van. Hubby acknowledged my plea to stop as we were heading out of the parking lot. 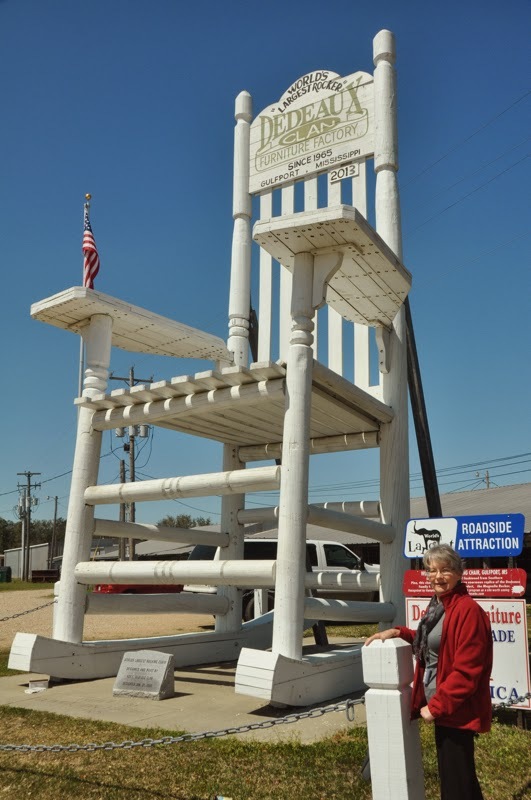 I wanted to take a photo of their giant rocking chair on display, touted as the world’s largest. He canceled my plan to snap a picture, though. Instead he had me posing by the Dedeaux rocker. I haven’t confirmed if it is indeed the world's largest, but I can confirm that it is a really huge rocking chair. Whine. I need my botox. My week started with the regular visit to my neurologist Dr. B. The office visit usually precedes botox injections several weeks later. The treatment temporarily relaxes the tone that curls my fingers into a tight fist and keeps my elbow bent. After meeting with Dr. B, I stopped by the check-out window to pick up paperwork and my appointment card for the botox. I expected an appointment for the shots to be around April 7, three months from the last treatment. And I was ready for the injections. I had delayed the December 2013 treatment until early January so that it would coincide with my readmittance to rehab therapy. The combination of the month’s delay and the unusually cold weather has intensified the tone to an uncomfortable degree far beyond anything I have experienced since Dr. B had initiated the treatments. But my jaw dropped when I saw May 8 on my appointment card. NOOOOOOOOOOO! He was already booked solid for April. May 8 was the earliest slot available. Maybe I brought upon myself the consequences of his packed schedule. I have been singing his praises ever since I started going to him. And I have recommended him to several folks whose stroke or brain injury has left them with effects similar to those I have from my hemorrhagic stroke. Now I can only hope someone cancels and I get the call to come in early for the injections. Of course, I would want their cancellation to be for some happy reason like maybe a sudden total healing or winning the lottery and going on a fabulously equipped and staffed neuro rehab cruise to exotic ports. I want that botox as early as possible. But I want it guilt free! Sadly that is the problem with specialists--getting a timely appointment. I sure hope some one wins the lottery soon so you can get your shot. Hey, as long as you don't scarf those sandwiches down daily and save them for special occasions, you should be OK. When I indulge in a forbidden, I pretty much fast the rest of the day. It is worth it. You sure do look short next to that rocker. Lol. As for appointments, I can sympathize as David has to wait 4 months to consult with his surgeon. Happy belated birthday Katie, she looks so happy and full of joy... oh no on the late botox... hope an earlier date pops up.. that chair is HUGE... wow... glad you stopped to snap it... and i love those sandwiches to. Why does everything that tastes yummy have evil attached to it???? I'm glad you could enjoy the sandwich anyway. When we eat out it seems I always pay for it the next day. Love the rocker and especially with your lovely face in the picture too. Hope you get an earlier appointment for the botox. Could I add you to the prayer list when we have our Bible Study here at our house tonight? Anyway, Happy First Day of Spring. First of all, I'm sending belated birthday wishes to your sweet DIL, Katie. Next, that's one BIG rocking chair!!! I'm glad you had your picture taken with it, to show its size in comparison. As for Chick-Fil-A sandwiches, they're good, but my weakness is hot fudge sundaes from McDonalds! I have no idea what the sugar grams are, nor do I want to! Last, I do hope you get an early call for your botox appointment, too! I hope you get it soon! I love Walter and the giant chair. Yes, get those shots, love that daughter in law, enjoy life guilt free for a moment or so. I confess I do too. We are off to breakfast shortly with an online friend, and it's going to be a delightful few hours with someone I know well but have never met who has a few of my problems too. Well, let's see, where do I start to respond to your this and that. I think I'll start with Chick-fil-a. I too really, really like the place and the sodium and fat filled little sandwiches and the French fries also. I was the one who last asked my husband if he wanted to go there for lunch. This was after eating some fat filled breakfast, and the fat filled lunch was followed by some fat filled dinner. The minute I walked out the door of Chick-fil-A, I had the familiar pain in my upper left quadrant. I ignored it. Finally, at 10:30 that night, ignoring the worsening pain no longer worked. I ended up in the ER. That is the second time I've ended up in the ER after eating these sandwiches with a gall bladder attack. I am disciplined everywhere else, but not at this eatery. I am so very sorry about the botox treatment being delayed. That is really upsetting. I will pray for an opening for you. I will. I hate to see you in pain and losing function. That's the thing with these docs that are so good. They have very full schedules. Take care. Goodness. I hate it when I need to see a doctor and have to wait several months. As for sodium, there is an upside to my low sodium levels. Girl Scout cookies are my weakness, but Joy and her bf love the chicken place. Sorry to hear you are having to wait so long for an appointment - have you thought of asking about a cancellation. As for the rocker - Wow!